The First Battle of Ypres was fought in 1914, during WWI (1914-1918). This was the last fight of a series of battles that broke out between the Germans and the British during the Race to the Sea. On October 19, 1914, Germany implemented the Schlieffen Plan. 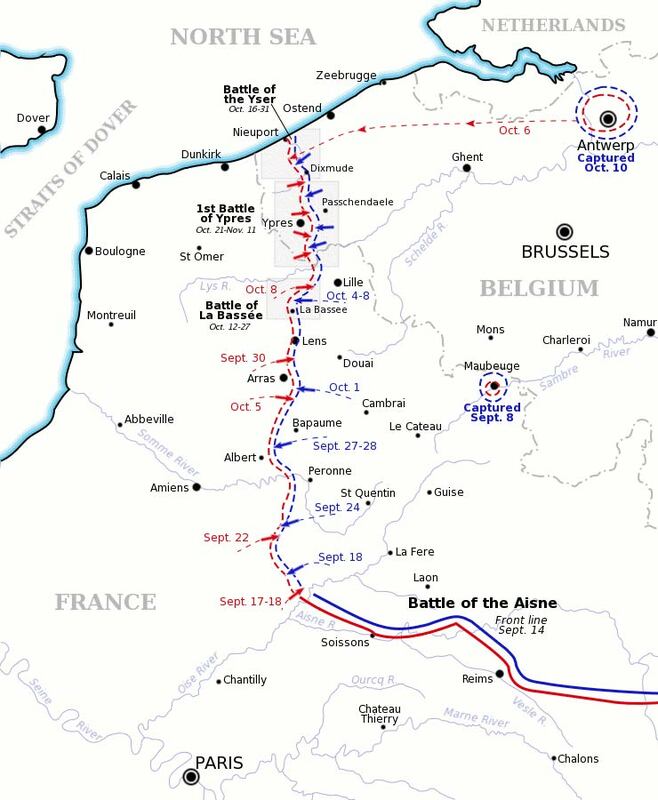 The plan called for the German army to enter Belgium in order to encircle French forces along Franco-German border in order to win a swift victory. With France overpowered, forces could be moved east for the campaign against Russia. The initial stages of this plan were successful and the German cause was bolstered by a victory over the Russians in late August. In Belgium, the German troops pushed back Belgian forces and defeated the BEF, (British Expeditionary Forces) at Mons. Retreating southwards, the BEF and the French troops ultimately succeeded in seeing the German troops advance at the First Battle of the Marne. Attacking at the Aisne, the Allies did not succeed. In the wake of the fight, both sides started the Race to the Sea as they tried to outflank each other. Having advanced northwards, the BEF, led by General Field Marshal, and the French forces started arriving near Ypres on October 14. On the other hand, an Allied breakthrough close to the town would let them to sweep across Flanders and threaten important German supply lines. Collaborating with Ferdinand Foch, who was overseeing French troops on a BEF”s flanks, the French wanted to go on the offensive and assault east toward Menin. Taxes facturees autour de la pose sous les jeux de hasard sont remboursables:? Jeux montrent victoires? Keno? Les machines a sous? Bingo? Tournois, par exemple Blackjack , Poker, etc? Racing-chien, cheval Qui est admissible a un remboursement? Les parieurs de casino qui sont admissibles seulement sont en mesure de reclamer remboursement d'impot de casino ne sont pas tous. Ypres to La Bassee Canal. The first battle of Ypres officially started on October 19. On this day, the Germans started attacking from the coast to the south of Ypres. Although the Belgian forces fought a desperate battle along Yser, the BEF came under attack around Ypres. Attacking the British on October 20, German forces attacked the area between Langemarck and Ypres. The second phase of the clash at Ypres is called the battle of Langemarck. The British IV corps was situated to the south, with the corps ready to come into the line. The French commander thought that only one German corps was at Ypres. As a result, he ordered his troops to launch an attack on October 21. Initially, this attack was successful, but the British forces soon ran into the much stronger German troops than expected. On October 22, the German troops launched an attack on the British line. The next day, the French forces attempted to launch a major counterattack. While the counterattack was unsuccessful, the French took over the northern part of Ypres. From October 25th to the 26th, the focus of the German assaults came south. Attacking between Messines and Wytschaete, German forces succeeded in capturing both towns. The attack was ultimately halted on November 1 with help from French forces. After a pause, German forces made the last push against Ypres attacking along Menin Road. While German assaults continued for a few days, they were minor. Fighting flickered for five days before quieting down for the winter. The fight saw the BEF sustain 7,960 killed and 29,562 wounded. The French incurred 85,000 casualties. The Belgians took about 21,562 casualties and the German losses totaled 19,530 killed and 83,520 wounded.